Global SuperTanker Service's Boeing 747-400 marked its first use in the United States after it was activated to fight a California wildfire. The company says the California Department of Forestry and Fire Protection exercised a call-when-needed contract Wednesday to fight a fire in Butte County about 10 miles east of Lake Oroville. At the time, the SuperTanker was at McClellan Air Force Base near Sacramento. The aircraft is based in Colorado Springs, Colorado. The converted jet can drop almost twice as much fire retardant as the largest air tanker currently in service. "We're the very largest in the world -- there's nobody out there that comes close," Global SuperTanker Service President and CEO Jim Wheeler told CBS News correspondent Mark Strassmann in an interview broadcast in July. "We can drop a line of retardant about three kilometers long or, if you will, about a mile-and-a-half," Wheeler told Strassmann as the plane performed a test run in Colorado last fall. In July, the U.S. Department of Agriculture's Interagency Airtanker Board issued a 17-month interim approval for the aircraft. However, the U.S. Forest Service has yet to give it permission to fight fires even though the plane was certified by the FAA last September and has also fought fires in Chile and Israel. A Forest Service contract would allow a state to be reimbursed by the federal government if the aircraft fought fires in that state. 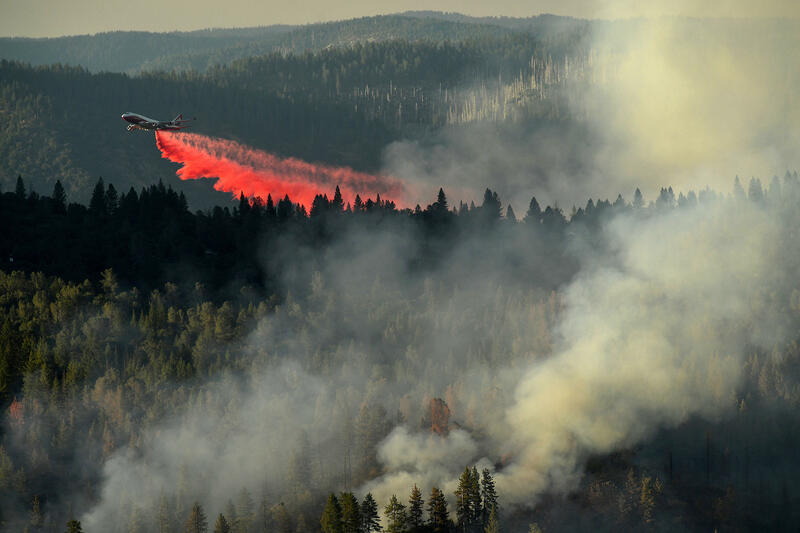 In May, the Forest Service issued a request for new air tankers but said it would only give contracts to planes with a dispensing capacity of between 3,000 and 5,000 gallons. The SuperTanker can drop more than 19,000 gallons of water or retardant at a time. Some firefighter advocacy groups suggested the Forest Service might be trying to control its budget, causing delays. The plane could cost as much as $120,000 a day to operate. The Forest Service said in July it couldn't comment on the dispute because Wheeler filed an official protest in June. According to Wheeler, the aircraft can be filled in 30 minutes or less. But it's not just the speed and size that make the SuperTanker powerful; its pressurized tank system atomizes the water when it's released, rather than just dumping it, like a bucket. "It doesn't break down tree limbs, it won't crush cars or buildings," Wheeler said. And a firefighter or a stranded resident who happens to be under a big dump of water from the aircraft will be fine, Wheeler said. "You'll get wet," he said, "but he won't be killed."